This debut novel from Chris Brown–many of whose earlier short stories appeared under the byline “Chris Nakashima-Brown”–has been long awaited by those who have keenly enjoyed his short fiction and essays since roughly 2004. (“The Launch Pad” appeared in the beautiful but short-lived reboot of Argosy in that year.) The wait proves worth it, since Tropic is a knockout first novel, paradoxically solemn yet exuberant, restrained yet inventive, as attested to by well-deserved encomiums from William Gibson, Bruce Sterling and Cory Doctorow. The first thing to mention is that the book falls squarely into the “America Disunited” subgenre which I surveyed a few months ago for The Barnes & Noble Review. 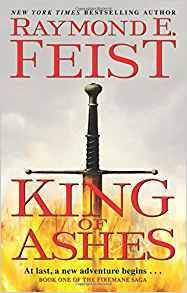 Although I could wish I had had this novel available then, I would have been forced to deal with it at shorter length, so allotting it full and separate, albeit later coverage turns out to be best! We start our story by vividly and sensually riding the shoulders of an on-the-run teenager named Sig. Sig has been living wild for years in the boonies and urban fringes of Canada until he’s caught by the RCMP and deported back to his native USA, a place he originally fled after much bad interaction with the authorities. Gradually Brown shows us Sig’s nature, his backstory and the sociopolitical context. Sig is inhabiting a future America that is falling apart at the seams, full of violence, dissent, rebellion, internal spying and law enforcement harshness. Central to the mess is a hole in the middle of the nation. Back east they called it the “Tropic of Kansas.” It wasn’t a specific place you could draw on a map, and Kansas wasn’t really even a part of it, but you knew when you were in it and you knew just what they meant. Which wasn’t a compliment. The parts of the Midwest that had somehow turned third world. They tried to return the Louisiana Purchase to the French, the joke went, but it was too damaged. They were still arguing about what caused it. Entire political movements had grown around different theories, but the truth was no one really knew. What they did know was that big swaths of the corn belt had turned sick, from bad splices, failed economics, burnt climate, broken politics, or divine retribution. Once back in this hellhole, Sig is locked up, escapes, and for the rest of the novel is continuously on the run, hounded and assaulted like the wild animals with whom he relates, touching down with various other outlaw comrades for short moments of warmth, safety and recuperation. It’s a harrowing journey akin to that of the child in Jerzy Kosinski’s The Painted Bird. This peripatetic existence permits Brown to show us numerous slices of the country, and allows him also to present a vast range of fully fleshed-out characters, each of whom embodies a different portion of the ruination of the land. Parallel to Sig’s tale is that of his step-sister Tania. Unlike Sig, she was rescued from her lower-class roots due to her intelligence and other gifts and groomed to be part of the Establishment. Working for the government in a bombed-out DC, she never thinks anymore of her long-departed step-brother –until she is recruited against her will to track him down. Thus begins Tania’s odyssey through many of the same venues that Sig is experiencing, plus other social and political strata he can never know. Together, their separate paths define all the options and parameters of the country, as they ride the waves of change that eventually culminate in a big bloody paradigm shift. Brown has chosen to deliver this adventure in nearly 120 short chapters of cinematic punchiness whose rapid flickering–especially notable and accelerating when we get into Part Eight of the book–mimics the harried, hectic future itself. He does something else very clever–I don’t think this is much of a spoiler–by defying the conventional impulse to converge his two threads. Tania and Sig never do hook up, except at the very end. This lack of familial connection, however bitter or tenuous it might have been, exactly echoes the fragmentation of the country. Now, this all might have hewed closer to a standard dystopia, well-done but not quite as innovative, except for Brown’s master stroke, the kind of maneuver Matt Ruff pulled with The Mirage. We learn before too long that this timeline is not ours. Things went pear-shaped in the 1980s, when President Reagan was killed and we ended up with President Haig, and a cascade of other changes. This revelation, far from diluting the forcefulness of the book’s message or making us care less, highlights Brown’s theme that so much of our destiny is precarious and contingent, and that the massed, communal decisions of every citizen are of the ultimate consequence in securing either salvation or damnation. The crowd of ruggedized network administrators and Kevlar-suited middle managers were too busy staggering through the Mardi Gras before the end of the world to notice. Tania almost stepped on one guy sacrificing the contents of his stomach to a dead president stenciled on the painted cinder-block wall. The revelers did not look like pirates. They had great teeth, dressed in tactical variations on business casual, and brought their lawyers with them. The military merchant companies always lawyered up on deployment, to make sure they didn’t violate the heavily negotiated terms of engagement chartered by Washington and end up blowing their corporate liability shield. Depending on who your direct report was, that could be worse than getting fragged by the local insurgents. But there’s actually more of an old-school New Wave feel to this book, in my eyes. Ballard is referenced a couple of times: President Mack’s fireside chats are titled “Hello America.” And the overall sensibility of the tale hews, I think, to a kind of John Brunner (Stand on Zanzibar), Norman Spinrad (Bug Jack Barron) esthetic and anger. And Sig, far from being noble or smart, and actually quite reprehensible in parts, might have stepped out of Disch’s 334. 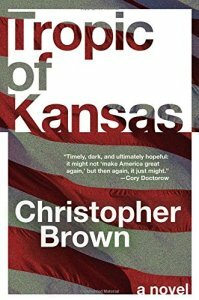 Full of gravitas, wry compassion and ornery Midwestern gumption and stubbornness, Tropic of Kansas, while ripped from current headlines, also speaks to the eternal battle to weld a nation of fifty states and five thousand ideologies into an organic whole.